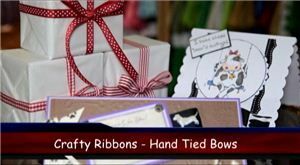 Learn how to create simple hand tied bows, from small bows to large. Also tricks for using single face ribbons for bows. ALL the ribbons on our website are suitable to make hand tied bows with!! But we used the Country Check Ribbons here and the Muddy Paw Ribbons here in this video. PLEASE NOTE: You can watch one of our video clips for FREE here. This is a download file and will not be posted to you.